»Blood Facts»Who are your blood types’ ancestors? Who are your blood types’ ancestors? 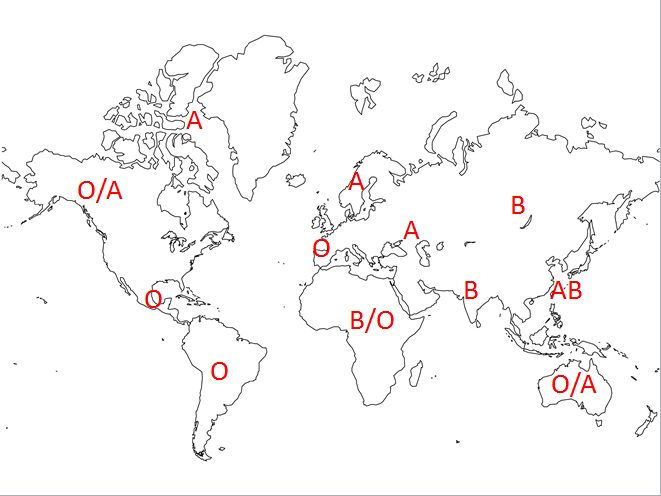 The 8 main blood types belonging to the ABO and Rhesus systems, are seen everywhere around the world. Well, almost everywhere, since some countries beg for blood donors of certain types. 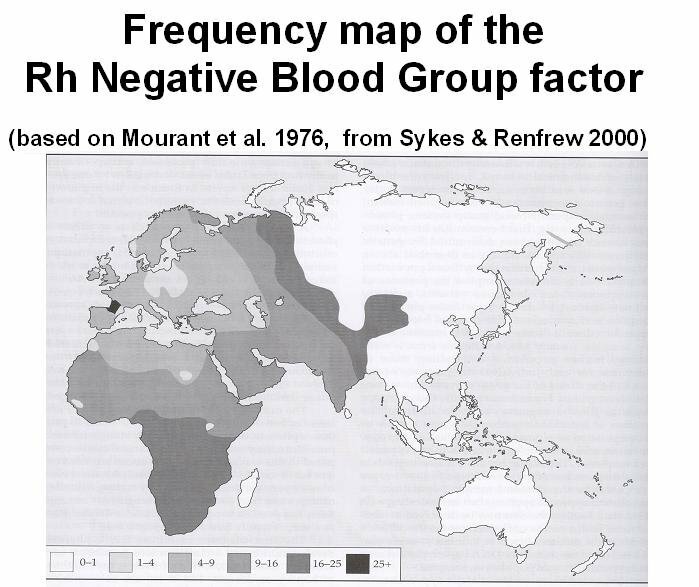 Contrary to what you may expect, the distribution differs in every corner of the globe according to many ethnic and racial analyses, done throughout the years by the blood banks around the world. 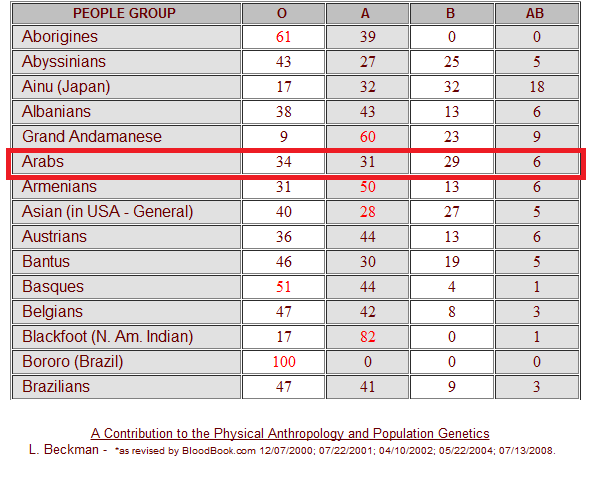 If your blood type is rare in your country, you can look for your worldwide ancestors and see where you got that from. It’s nice to have American or Asian roots after all, isn’t it? The following maps sum it up for you. As you may see, the O allele is very common around the world. More than 60% of humans share it. Its frequency is particularly elevated among Central and South America, where it approaches 100% in some countries! It reaches high frequencies too among Australian Aborigines and in Western Europe (especially in populations with Celtic ancestors). However, the lowest frequency of it is found in Eastern Europe and Central Asia, where B is common. The A is the second most common allele around the world with more than 20% of all people sharing it. The highest frequencies are found in Scandinavia and Central Europe in small, unrelated populations, especially the Blackfoot Indians of Montana (30-35%), the Australian Aborigines (many groups are 40-53%), and the Lapps, or Saami people, of Northern Scandinavia (50-90%). The allele is almost totally absent among Central and South American Indians. Overall in the world, B is the rarest ABO blood allele. Only 16% of humanity have it. It reaches its highest frequency in Central Asia and Northern India, while it is believed to have been entirely absent from Native American and Australian Aboriginal populations prior to the arrival of Europeans in those areas. However, there are relatively high frequency pockets in Africa as well. The majority of the people in the world have the Rh+ blood type. However, it is more common in some regions. Most Subsaharan African populations are around 97-99% Rh+. East Asians are 93-99+% Rh+. Europeans have the lowest frequency of this blood type for any continent. They are 83-85% Rh+. 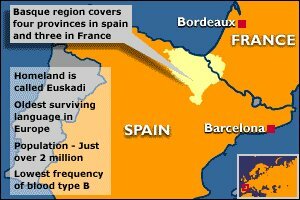 The lowest known frequency is found among the Basques of the Pyrenees Mountains between France and Spain. They are only 65% Rh+. Why is knowing the blood types’ distribution important? As you see, a “B” individual going to America, Europe or Australia might find some tough times looking for people of his blood type. The same applies to an “O” visiting Asia or an “A” heading to Africa. Moreover, it is even more difficult if you’re looking for negative blood types, outside of Europe, since the positive types reach more than 90-95% of the population sometimes. This is where we, Arabs, stand with a pretty much equally divided distribution in our countries between the A, O and B alleles. 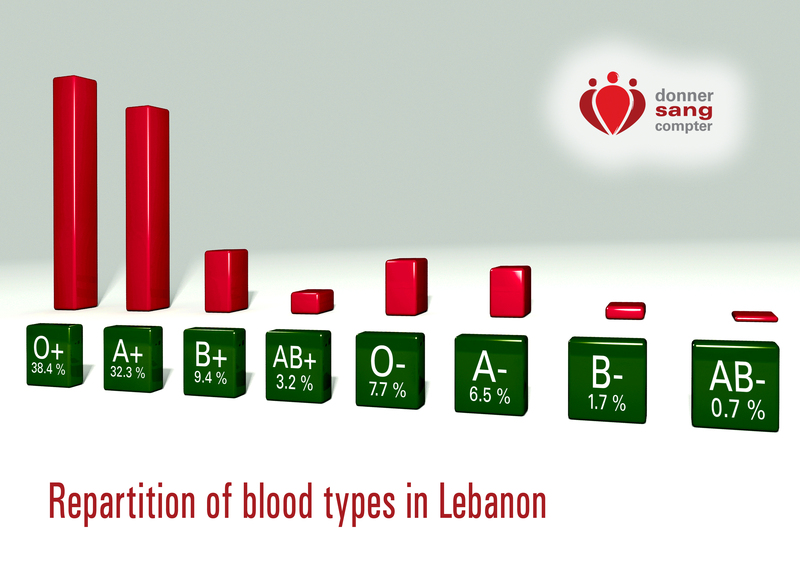 Lebanon nearly obeys this pattern, according to our statistics, where 45% of the population are “O”, 39% are “A”, 10% are “B” with a mere 4% for the “A” and “B” alleles combined. Whenever you feel like visiting a certain country, for whatever reasons, DSC advises you to do a small research about the frequency of your blood type in it and whether it can be easily found, in case – God forbids – you might need a transfusion during your stay. If ever the country’s population doesn’t meet with your blood type, especially for the ones where some types are so predominant they might reach more than 90% of it, consider donating blood for yourself while staying there, particularly for work issues or simply grab a friend of your type with you in case you’re going sightseeing. It’s nice to be a international donor after all!